This may or may not be a big deal for you. In some cases, the new (improved?) operating system might just mean some personal and staff retraining. Some of your hardware might need reinstallation or replacement. Depending upon your previous system (e.g. Windows 7), things will likely be a lot slower. However, businesses that use proprietary software (e.g. dental, medical, industry-specific and hardware-specific) should do serious research before considering Windows 10 (or any alternative operating system). Untested, this OS could break your system and, in doing so, corrupt your data. "Don't Click Okay To Not Stop The Installation..."
Many believe the confusing and convoluted launch of Windows 10 may damage Microsoft's already flagging reputation. Some are also reporting that Win10 has overwritten Windows 7 and installed itself without permission. 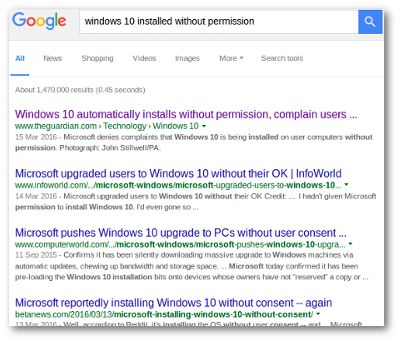 As of the 20th May 2016, "Windows 10 installed without permission," resulted in nearly 1.5 million hits on Google (though far fewer are listed on Microsoft's Bing search engine... wink!). On some PCs, the "offer" to upgrade was optional. On others, it appeared based upon their Windows Update settings (i.e. only if "recommended updates" were selected). Still other users report that the upgrade happened despite repeated attempts to thwart it. First, get a backup of your machine. We suggest a full hard drive image backup. If done correctly, you can mark on your calendar a "wind back the clock" moment. Second, identify any meaningful files on your machine and back them up on scheduled basis. Third, check your Windows Update settings, disabling the "recommended updates" setting. That allows basic system and security updates through but (for the moment) stops Microsoft-based adware from getting in. Fourth, if you do not want Windows 10, disable the Microsoft GWX system ("Get Windows X"... see what they did there?). This is not for the faint of heart, but reasonable guides exist, so Google, DuckDuckGo and the like are your friends (...not so much, Bing). What If I Want To GWX? Good for you! Microsoft needs lots of testers on this new operating system, and why not you? Seriously, if you don't use proprietary software and if your hardware is, say, less than a year and a half old, then by all means try it. Just have reasonable expectations. The OS celebrates its one year anniversary in July 2016 and the first one to two years are always a little rocky. And for the love of your own well-being, make sure you have well-tested backups. As always... having a good plan and the right equipment means the difference between irritation and catastrophe. For those who may not know, we are a local Computer, Network and Information Technology company in the north Cotswolds, operating out of Broadway, Worcestershire. Our main focus is small and medium sized businesses in the area needing assistance with their computer systems, websites and IT support processes. We routinely help to integrate new technology with what is already present, get existing systems to work correctly and aide in disaster prevention and recovery. Web support varies from simple website and mail system establishment to fully customised enterprise deployment and management, including PHP and ASP development. We are a small and dedicated team that understands the priorities and concerns of each client, regardless of size or complexity. The Permutation Company is here when you need us. Question (paraphrased): "I've accessed a website that says it uses 'ActiveX controls,' and that I need to use Internet Explorer for it to work properly. Answer: ActiveX is a scripting language used by websites that generally can only be used with the Microsoft Internet Explorer web browser. That means you likely can only access the site from a Windows PC (i.e. NOT an Apple or Android device). Whether specific ActiveX scripts are risky is not really the right question. Whether or not the website, itself, is risky... that's more relevant. Scripting can be either useful or malicious, so it's important to evaluate the source, rather than the technology. As an aside, I recently installed a security camera, where its administration menu used ActiveX. I could only properly configure it from a Windows PC via Internet Explorer. This as very irritating for a Firefox user like myself. Fortunately, the general use of ActiveX is becoming less common.